Seemingly, the above quotation is a throwaway line from "Say Goodbye to Hollywood," a track off of Eminem's 2002 album The Eminem Show. However, it also draws attention to the notion of comic books as an escape from reality: a black-and-white world painted in vivid color. Where heroes and villains are easily identifiable, and problems are wrapped up conveniently over a half-dozen 32-page issues. This is the comic book as it has been known for most of the twentieth century. Today, the comic book acts as a social mirror; slightly distorting issues ripped from the headlines and packaging them with flashy, iconic imagery. But when do comic writers venture too far into the realm of the realistic, discarding the escapism that makes comic books so appealing in the first place? Case in point: Marvel's Civil War miniseries. 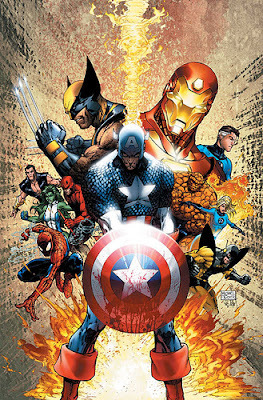 On the surface, it featured Marvel characters attempting to establish order through government intervention and superhero registration. Led by Tony Stark (Iron Man), these registered heroes would be employees of the United States government and would be required to reveal their identities to an ever-skeptical populace. Of course, this idea did not gel with all of Marvel's heroes. Captain America led a group opposing superhero registration, thus beginning Marvel's latest "event" story arc. The parallels are obvious here. Superhero registration, an allegory of the Bush administration's Patriot Act, which, in the storyline, is not in line with (Captain) America's best interests. We get it. Of course, this doesn't mean we have to like it. Marvel's sweeping story arc left most fans cold, with its free and loose characterization and storyline decisions that would create gaping holes in other titles that will take months to fix. 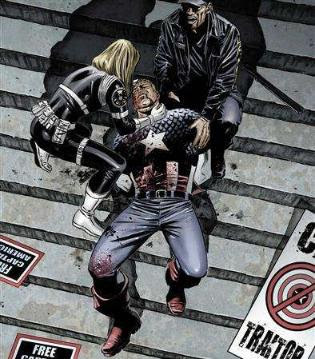 If the Civil War wasn't enough to drill political and social commentary into fans' heads, the conflict was ended when a sniper shot a handcuffed Captain America through the chest, killing him. It may have caused a spike in sales, but it also left fans wondering if comic books will ever again remember that they're comic books and have fun again. The death of American idealism: on sale, with variant covers no less. This year also marked the return of Spider-Man's black costume, an obvious marketing tie-in with Spider-Man 3. Once again, characterization of a beloved character went right out the figurative window...but didn't the black costume make him look dark and brooding again? Wait, this is Spider-Man we're talking about. Why do we want dark and brooding again? 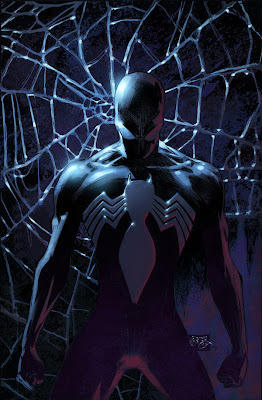 The "Back in Black" storyline featured Peter Parker out for revenge, after a sniper (another one?) critically wounds his Aunt May. We've seen Peter angry before, and it's understandable here. But at times during this arc he's downright selfish. His aunt is dying, yet here he is whining about all the lines that he's crossed to keep her alive. Hey buddy, we know the title of the book is The Amazing Spider-Man, but in this case, it ain't all about you. But, this was all an intent to humanize the character. And for that, I applaud the writers for adding some depth to Peter in a time of crisis and exposing his faults. But is that what comic book readers really want? Shouldn't comics be a chance to escape worldly worries for a few minutes at a time for a few bucks a pop? If I want commentary on the human condition, I'll read Ayn Rand. When I want guys with spider powers fighting monster lizards or mad scientists with octopus arms grafted to their bodies, well, make mine Marvel. While it may seem like I'm bashing the very medium that I claim to love, I'm merely pointing out that the growth of comic books as an art form has resulted in an overall inability for it to embrace its own roots. Good versus evil. Making the impossible possible. 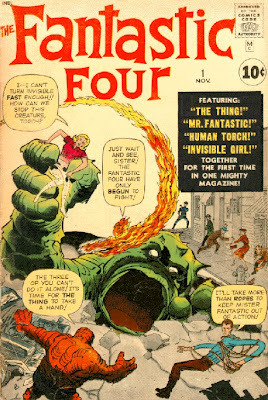 The kind of stuff that Jack Kirby and Stan Lee dreamed of in the 60s. Jerry Siegel and Joe Shuster's simple belief that a man could fly decades before that. It's all in there still, lost in the shuffle. Cast aside due to the pressure to remain relevant. To be important. Well, for a lot of people, comics have always been important. But if I want reality, I'll put down my issue of Astonishing X-Men and pick up a New York Times. We've got enough reality. Do we really need it in our comic books?